Thankfully, frameworks such as Bootstrap (formerly known as Twitter Bootstrap) make such design requests fairly simple—and even simpler with the new release of Bootstrap 3. This is a 3-part series. In the first part, we’ll only be looking at Bootstrap 3 and how to customize it using HTML and CSS. In the second part, we’ll look at how to set up an effective sales landing page. Check it out here. 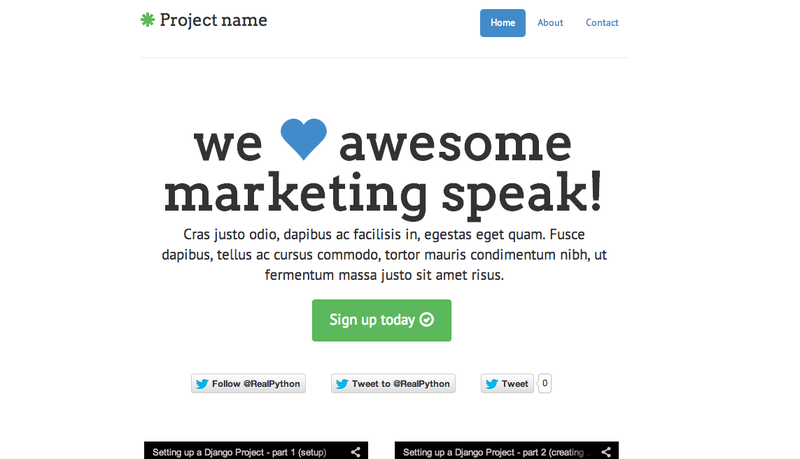 Finally, in the last part, we’ll add Python into the mix to build a landing page using Flask + Bootstrap 3. You can grab the final styles/pages from this repo. Start by downloading Bootstrap from the official site. Unpack the zip and grab the dist directory. This will be our root folder for this little project. Be sure to add jquery.js from assets/js to dist/js. At first glance, you can see that all components are flat. And if you’re not a fan of flat design there is an alternative theme. Play around with the responsiveness by resizing your browser. Looks pretty good. Responsiveness is now a default in Bootstrap 3 - so now you don’t have a choice: You must develop for mobile first. The grid system is now much easier to use. It scales up to 12 columns by default, which can be altered for four devices—large desktops, desktops, tablets, and phones. It’s also fluid by default as you will soon see. Since each row has 12 units, we made three columns that are 4 units each. Just remember that all columns must add up to 12. Experiment a bit: Try changing the first column to 2 units and the last column to 8 units, or add a new row altogether with another set of columns (or just wait until the next step). Here, we used offset, which shifted the column to the right to center it. Essentially, we shifted over 2 units, then used an 8 unit column, leaving another 2 units after, equaling 12: 2 + 8 + 2 = 12. Since the grid system in Bootstrap 3 is responsive, you can nest a row within another row (another new feature). The inner row - e.g., the row within a row - will have 12 columns. It may help to draw this out. Try this on your own before looking at my example. So, we took the first column, with a span of 4, and nested it so that it has four boxes of equal size. Also, you probably noticed the list within the far right column. This is another new feature in Bootstrap 3, called List Groups. Test that out. Have some fun with it. Try toying with the background color of the Jumbotron by adding an image, a gradient, or even a basic color: <div class="jumbotron" style="background-color: #BAE0FF;">. Such little changes can make a big difference. Make sure your page looks like mine. Let’s take this a step further and create a working example. One of my favorite examples from Bootstrap 2 is the Narrow Marketing Template, which, sadly, isn’t part of the examples included with Bootstrap 3. So let’s create it ourselves from scratch. Start with a basic page. Jumbotron. Add the styles first, and then add the Jumbotron below the <hr>. Marketing Section. Again, add the styles first, then remove the <container></container> element and add in the marketing row. Footer. Notice the extra </div>. This should close <div class="container-narrow">. That’s it. 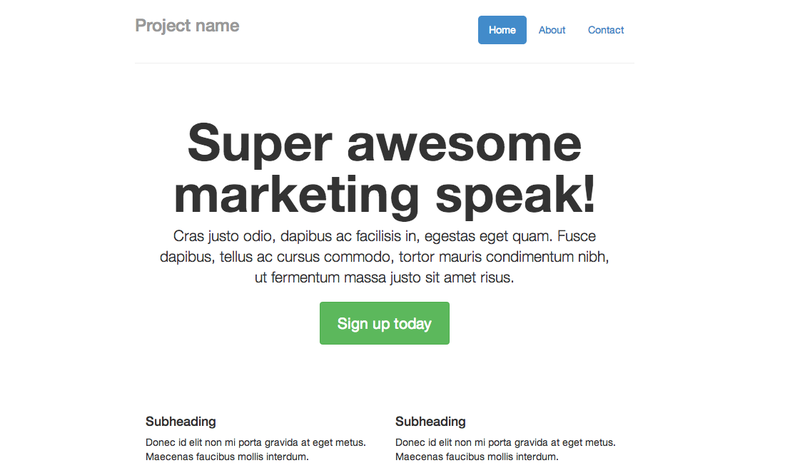 Compare this version to the Bootstrap 2 version. Similar. But flat. Let’s look at some quick ways that you can customize this example to make it look less “Bootstrappy”. As you can probably tell, it’s difficult to find two fonts that look good together. Fortunately, there are a lot of good resources - like here and here. Textures can make a big difference, which is why I love Subtle Patterns. Update the body class with the following code. Make sure to make the Jumbotron transparent as well. Update the Marketing section so that there is just one row with three columns (each spanning 4 units). Let’s also put the new Glyphicons to use. 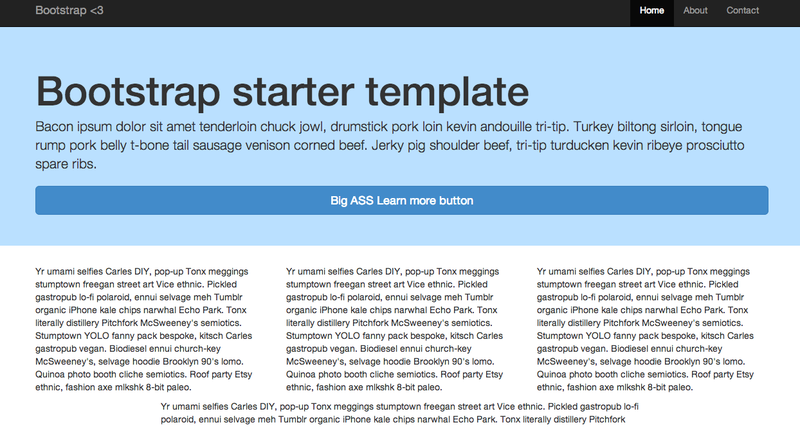 Or you can use Font Awesome since we added the stylesheet. Above the marketing section let’s add a new row with two videos, which hopefully have something to do with your products or services (or at least explains why your site exists). Good? At the very least, with these basic changes—which took a good five minutes—you are now well underway to taking a generic theme and making it a bit more professional. Cheers.